Shanra, at Libri Touches, is having a Tam Lin reading event during the month of October (1st through 31st). She would be thrilled if others would like to join her in reading novels based on the Tam Lin ballad. 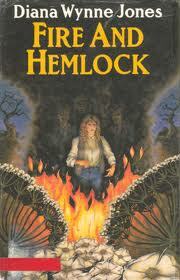 I had to go ahead and read Fire and Hemlock because of a library due date, so I'm a little outside of her date range. But I did wait to post my review until October 1st! I will also be reading Tam Lin by Pamela Dean this month. Fire and Hemlock is based on two Scottish ballads, Tam Lin and Thomas the Rhymer. It is a coming of age story and a tale of reclaimed childhood memories that had been, mysteriously, lost. Polly is cleaning her childhood bedroom and packing for college when she suddenly begins to remember things that she had forgotten ... mainly memories of Tom Lynn, a mysterious man she had befriended in her childhood. She thinks it quite odd that she would have forgotten someone who had made such a strong impression upon her at one time. It is even more odd that she has, apparently, two sets of memories -- one rather ordinary and the other quite strange. Flashback: Ten year old Polly lives with her Gran because of a complicated relationship with her parents. One day she wanders into a rather strange funeral at the large mysterious house down the lane. Here she meets Tom, an adult willing to indulge Polly's make believe escapades. Together they create story lines. The strange bit is that the stories come, more or less, true! The majority of the book is Polly's story as she grows through adolescence into her late teens. Included are all of the attendant relational struggles and trials of growing up including that of finding out who her true friends are. Tom comes and goes from her life as he travels with his musical quartet, but he keeps in touch by sending Polly books. She reads them all. At one point, she expends a fair amount of time and energy writing a story that tells of the escapades of the fictional versions of herself and Tom. She sends this "tome" to Tom and receives a message back from him: "Sentimental drivel." Oh, how painful. You can imagine the cliches written by a fourteen year old girl with a romantic imagination, but to bravely put that writing out there only to be harshly criticized by someone you admire is ... well ... devastating. Back to the present: The last part of the book is the merging of the two timelines as memories sort themselves out. This is where the book becomes much more fantastical. Previously, there were indications of the fantastic -- sorcery, intrigue, magic and mystery. Now there is no doubt that all is not what it seems to be. Enter the Queen of Faerie and an explanation of the mystery of lost memories. To tell you more would be a spoiler. The author held me enthralled. I loved the coming of age struggle and I loved the mysterious and fantastical elements. At it's core Fire and Hemlock is also a sweet love story that doesn't truly present itself as viable until the very end. I did read the ending several times because I felt a bit muddled, but I have a feeling that if I were fourteen I would have understood as only the young can understand sometimes. Hallowe'en is the night of sacrifice in both the book and ballad versions. Both Janet (ballad) and Polly (book) set the story in motion by entering faerie territory. Seven years is the length of time that Tam Lin is held captive by the Faerie Queen in the ballad. Seven years might be the length of time between Polly's first meeting with Tom and the end event that releases Tom from captivity to the Queen of Faerie in the book. I'm not sure on this point, but it would be intriguing if true. Both Janet (ballad) and Polly (book) must win Tam Lin/Tom Lynn from the Faerie Queen. My idea of a date range (and, uhm, participation) is incredibly loose. ^-^; Anything Tam Lin goes, provided the talking about it gets done in/close to October. I hope you do a comparison post at the end of the month. That would be quite interesting. I read this last week, and I also loved it! I've found Diana Wynne Jones to be such a reliable source for great stories.